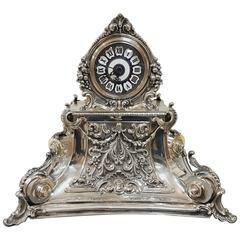 Superb lamp in solid sterling silver completely worked, embossed and hand chiselled. 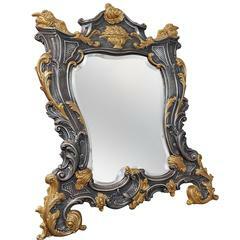 The square base and the stem are enriched with acanthus leaves, fruits and leaflets, typical of the Baroque style. 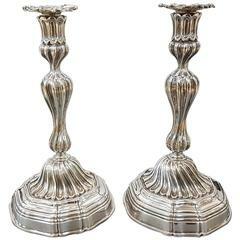 Its imposing size is suitable for environments of a certain importance, both in terms of elegance and size 5.200 grams of sterling silver Steam 57 cm Base 25 x 25 cm Height including hat cm. 93. 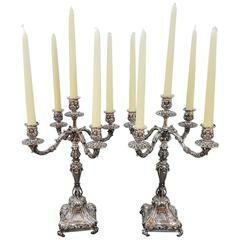 Sterling silver candelabra with four branches, made in Israel, weight approximately 42 oz troy.